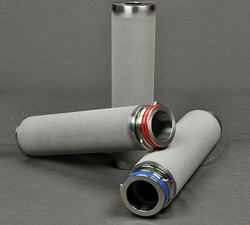 The wide range of Sintered Filters we offer are used in back flushing and repeat cleaning filtration applications. 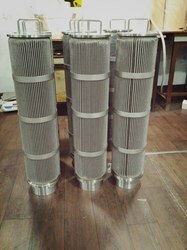 These sintered steel filters elements are designed to work in high temperature and extremely corrosive environment. We are offering a superior quality range of S. S. Sintered to our clients. The offered product is manufactured from excellent quality raw material and advanced technology as per set industry norms. This is stringently tested on various parameters in order to deliver defect free range at clients end. Moreover, offered range is available to our clients at highly affordable rates. - Material:Stainless Steel 304, 316, 202 or as per your request. Our firm is enlisted as one of the renowned names in offering high-quality Sintered Metal Filters. Known for its high filtration rate, it is used in various filtration applications. Checked on various quality assurance parameters by our quality controllers, the quality of these products is never compromised. Leveraging on our vast industry experience, we are providing a high quality range of Generator Filter. For high temperature resistance & long life. Our range of Sintered filter (Ceramic) are made of ceramic, bronze and stain less steel. Used in wide industrial application, they can be customized as per specific requirements of our clients. Machine India Tech Pvt. Ltd.